Reversing the landmark case would not automatically make abortion illegal across the country. 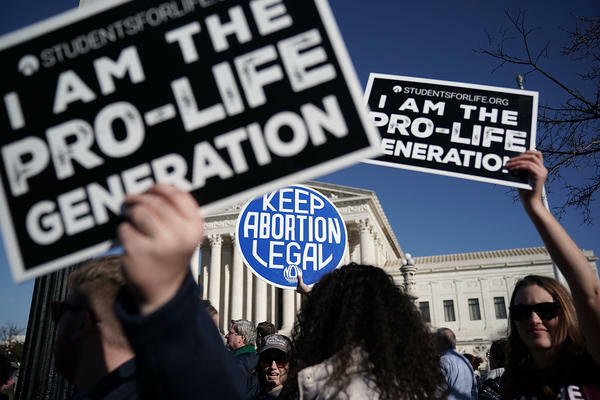 Instead, it would return the decision about abortion legality to the states, where a patchwork of laws already in place render abortion more or less available, largely depending on individual states' political leanings. "We think there are 22 states likely to ban abortion without Roe" because of a combination of factors including existing laws and regulations on the books and the positions of the governors and state legislatures, says Amy Myrick, staff attorney at the Center for Reproductive Rights, which represents abortion-rights advocates in court. Kavanaugh never opined on Roe v. Wade directly during his tenure on the U.S. Court of Appeals in Washington, D.C. In his 2006 confirmation hearing for that position, though, he said he would follow Roe v. Wade as a "binding precedent" of the Supreme Court — which judges in lower courts are required to do. "Judge Kavanaugh is an experienced, principled jurist with a strong record of protecting life and constitutional rights," said a written statement from Marjorie Dannenfelser, president of Susan B. Anthony List. Dannenfelser spearheaded support for Trump in his presidential campaign after he promised to appoint to the Supreme Court only justices who would overturn Roe v. Wade. According to an analysis by the Guttmacher Institute, a reproductive-rights think tank, 19 states have adopted 63 new restrictions on abortion rights and access. As of now, four states — Louisiana, Mississippi and North and South Dakota — have what are known as abortion "trigger laws." Those laws, passed long after Roe was handed down, would make abortion illegal if and when the Supreme Court were to say Roe is no more. Several major challenges to state abortion laws are already in the judicial pipeline. One of these will have to get to the Supreme Court to enable a majority to overturn Roe. "It's not a question of if; it's a question of what or when," says Sarah Lipton-Lubet, vice president for reproductive health and rights at the National Partnership for Women and Families. The first — and most likely type to result in the court taking a broad look at Roe — are "gestational" bans that seek to restrict abortion at a certain point in pregnancy, says Lipton-Lubet.